D3 Consulting have a great wealth of experience in offshore decommissioning, having developed Materials Inventories and Waste Characterisation for more than 45 North Sea Platforms. At D3 Consulting we provide Waste Assurance to operators and their supply chain throughout the decommissioning cycle. Our unique DAWN information management system has been developed specifically for offshore decommissioning and provides operators with waste assurance and waste tracking through the whole offshore decommissioning cycle. From an initial gap analysis of waste and materials data & information held by operators, Decommissioning Programmes,through to pre-populating bespoke reports and forms, generation of survey and sampling plans, and ensuring that the data held is validated and verified. With DAWN, regulatory compliance in waste and materials management just became a lot more straightforward! With the Duty of Care regulatory requirement, D3 Consulting are often asked by operators to work with the onshore disposal of the platforms, and to provide waste assurance. As part of our decommissioning service, we carry out yard audits and take responsibility for approbate yard selection. When selecting a yard it’s crucial to understand their level of competence, that they’ve got the right permits and licenses to do the work, that they’ve got enough space, that they’ve got the necessary infrastructure to do the work and also that they’ve got the right experience to do the work. Recognised as an authority in this area, D3 are working alongside Decom North Sea, the main trade association for offshore decommissioning, to write the Offshore Decommissioning Waste Management Guidelines, something that we are currently in the process of creating. The work is supported by by the Department for Business, Energy and Industrial Strategy, along with the EA, SEPA and the HSE. For all onshore recycling and disposal projects you need to have a CDM Principal Designer - a health and safety advisor who supports the projects and ensures that the onshore works are carried out safely and to the Construction (Design and Management) 2015 Regulations. As CDM Principal Designer, we work alongside the operator and the contractor to make sure that the right information is given to the right people at the right time, thereby improving health and safety at the works. D3 Consulting offers one day waste awareness training sessions for contractors working in offshore decommissioning. 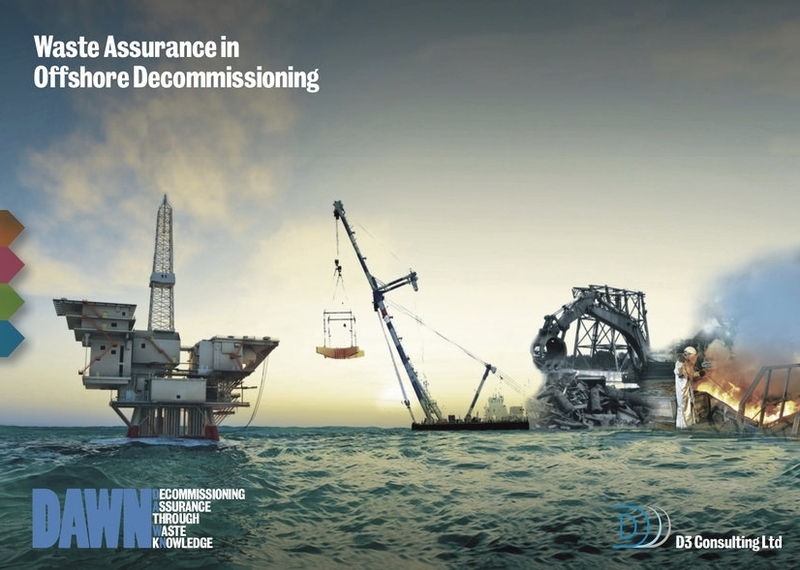 Over the past years, D3 Consulting has mapped and managed waste from more than 45 North Sea platforms scheduled for decommissioning and we are currently authoring the Decom North Sea’s industry guidelines on ‘Managing Offshore Decommissioning Waste’.